Hokkaido in northern Japan holds a special place in our hearts - this is where DaDi and I visited for our honeymoon trip! N years later, we are going to visit Hokkaido again, together with our children. How to get from Singapore to Hokkaido? Singapore Airlines has seasonal direct flight from Singapore to Sapporo (New Chitose Airport), usually in the end of the year. Out of curiosity, I checked the fare for Singapore Airline's direct flight, and my eyes popped out when I saw SGD 1k+ per person!!! Did I miss out any sale? Scoot also offers seasonal direct flight from Singapore to Sapporo, as I checked in November 2018, the direct flight is available in November 2018 and January 2019. The FlyBag fare can be as low as SGD600+! Some of my friends shared with me that they went to Hokkaido by Thai Airways (transit at Bangkok), and the fare can be as low as SGD400! I didn't have the luck to get such a good rate! During a promotion in November 2018, we managed to book our flight for June 2019 at SGD2k for 2 adults and 2 children. Please take note that the fare reflected on Thai Airways official website is subjected to currency conversion fee, the amount depends on the bank that your credit card is issued. We paid 1% of currency conversion fee for our air tickets. Alternatively, you can fly by Scoot with transit at Taipei, or by Air China with transit at Beijing, or by China Eastern Airlines with transit at Shanghai, or by Philippines Airlines with transit at Manila, and so on. During our honeymoon trip, we took All Nippon Airways to Tokyo, and changed domestic flight to Sapporo. You can travel using this route by flying with Japan Airlines too. When you are booking such route, please open your eyes big big to check that the airport that you arrive at Tokyo, and departing from Tokyo to Sapporo are the same! Because there are two airports in Tokyo - Narita Airport and Haneda Airport! As we followed group tour for our honeymoon trip, we landed at Narita Airport, and then took a one-hour coach to Haneda Airport! It can be very troublesome! Please also note that you have to collect your luggage when you reach Tokyo and proceed to clear the immigration, then you have to deposit your luggage with the domestic flight. Other than Tokyo, you can choose to fly from Singapore to different parts of Japan like Osaka and then change domestic flight to Hokkaido. Other than All Nippon Airways and Japan Airlines, there are other domestic airlines in Japan like Air Do, Jetstar Japan, Skymark Airlines, Spring Japan and Vanilla Air. One more thing, if you fly by domestic flight, you can have the flexibility to land at airports in Hokkaido other than New Chitose Airport, for example. Hakodate Airport (southern part of Hokkaido), Asahikawa Airport or Wakkanai Airport (northern part of Hokkaido), Kushiro Airport (eastern part of Hokkaido) and so on. If you have the time to spare, or you are also visiting Tohoku region (northeast part) of Japan, then you can consider taking Shinkansen (bullet train) from Tokyo to Hakodate at the southern part of Hokkaido. This takes about 4 hours. To get from from Hakodate to Sapporo by train, then you need another 3.5 hours to travel! And the total fare can be more expensive as compared to taking domestic flight! This would not be an option for us, as we are travelling with children. Stay tuned for our Hokkaido travelogue in 2019! 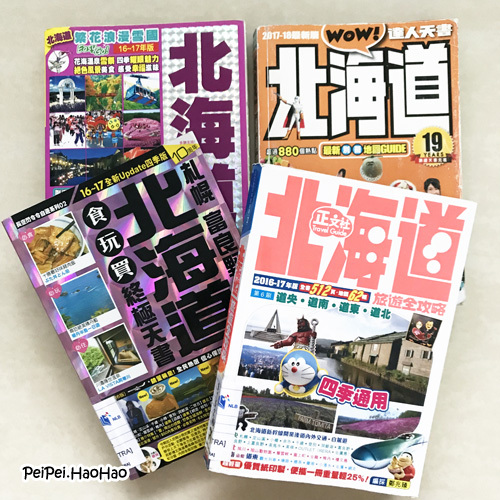 Yes, when I do "homework" for Japan trips, I prefer reading Chinese travel books published in Hong Kong or Taiwan, they are more informative than English travel books.